It is our common experience to observe that the lowest levels of the atmosphere cool down more slowly on humid nights than on dry nights. When the sky is cloudy we observe the atmosphere to cool even more slowly. Can longwave radiation fluxes alone explain these observations? This learning object uses a simple interactive model to demonstrate the role of radiation in nighttime cooling. As a learning object, it is meant to supplement other teaching material in a course by elucidating a specific concept. 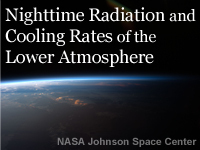 By adjusting the emissivity and temperature of earth and atmospheric layers, the student can derive the role of radiation in nighttime cooling. A series of questions explore the effects of dry, humid, and cloudy conditions in the lower atmosphere. The model includes radiation flux balances and doesn't consider sensible or latent heat fluxes. But the last question in each of the sections (dry atmosphere, humid atm, and cloudy atm) have an answer that considers sensible heat transport to be the primary mechanism modifying the temperatures of the lowest atmosphere levels. It should be the radiation balance that does it. Describe how humidity and clouds change the emissivity of the atmosphere. Describe how emissivity and temperature of the atmosphere affect the rate of nighttime cooling in the lower atmosphere.